19 found when searching for "As Heard On Radio Soulwax"
Amazing creativity and great song selections. Only negative remarks pertain to the recording quality. Disc 2 sounds great, which is a Play It Again Sam production, whereas discs 3 & 5 sound like complete crap, and in some cases won't even play in my players. The latter two are Waxedsoul Recordings. Maybe it's a quality control issue. If you can preview the recording before purchasing I highly recomend it. Out of all the DJ's I've heard, the Dewaele brothers must be the most exciting. Some may call their techniques and mixes silly, but in most cases the work! 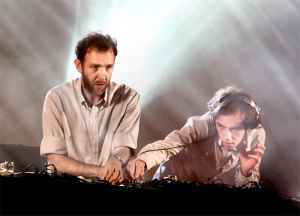 For example, take As Heard On Radio Soulwax Pt. 2's Dolly Parton into Royksopp mix; it shouldn't work, but somehow it does! In my opinion, they're the best DJs ever, ditching the boredom of mixing the new "popular" songs with each other, and instead taking anything and seeing if it works. However, in their case, it always does.